It’s been a while since I posted anything photographic and hobby related here, so I thought I would share this little guy with you all today. 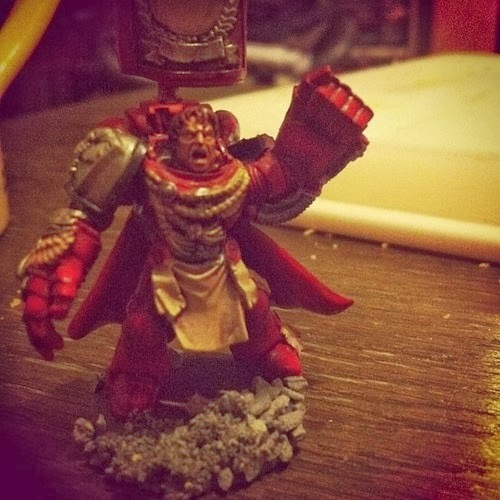 He is the Blood Guards Company Captain, dual wielding Power Fists – because that’s just fun-times ahead right!? I don’t actually have any notes on him other than he is the Company Captain and uses the Fists, so I’ll make something up about him on the fly! And there we have it, a personality and a reason written for a small model in less than five minutes. It may seem a little odd, but I give all of my key characters in the Blood Guard a little personality of their own; mostly sergeants and the likes. Giving all the models something about them would be a bit too much. Not every tactical marine needs mourning! I will see about doing these little things for all the note-worthy Marines I have – with silly little profile pictures taken from my iPhone. It’s good to keep the imagination going; even with fangirly things.